First place the bananas, berries, oats and apple juice in a liquidizer. Blitz for a few minutes until the berries and banana are completely smooth and the porridge oats are whizzed up. Then taste for sweetness – if the bananas are lovely and ripe the mixture should be sweet enough, if not, add honey to taste. Divide the smoothie mixture into 12 ice-lolly molds and freeze for at least 2 hours. And give the lollies a chocolate coating, place the chocolate in a heatproof bowl over a small pan of simmering water. Make sure the water isn't boiling and the bottom of the bowl doesn't touch the water, or you will burn the chocolate. Stir until completely smooth, then take off the heat and leave for 5 minutes. Now when the lolly sticks to loosen the lollies and lift them out. One by one, dip the tips of the lollies in the white chocolate and leave to set for a few minutes before serving. Then a fun, pretty way to serve these lollies is to cover some flower-arranging oasis with fresh flowers, tinfoil or colored tissue paper, and stick the lilies in. For an extra-special entrance, pop in a few sparklers – but be careful. Its making sure children get the right nutrition is very important to us, so for more guidance on cooking for kids, please. Where as it's delicious vegetarian or vegan recipes you're after, or ideas for gluten or dairy-free dishes, you'll find plenty here to inspire you. For more info on how we classify our lifestyle recipes please read our or for more information on how to plan your meals please see our audience. Finally serve this lolly for kids. 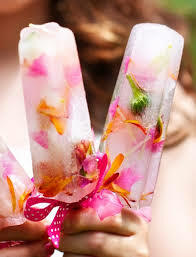 These ice lolly is so so yummy.So now try this home.